The first Ground Up publication is due out in August 2006. 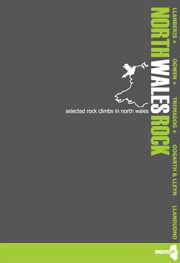 North Wales Rock is a new selected guide to the crags of northwest Wales. The guide showcases over 600 of the finest climbs from all the best areas: the Llanberis Pass, Dinorwig Slate Quarries, Cloggy, Lliwedd and Llechog, Ogwen and the Carneddau, Tremadog and the Moelwyns, Gogarth, the Lleyn Peninsula and the Llandudno limestone crags. This is a thoroughly modern production using full colour topos, extensive area maps and individual crag approach maps. It also features an unprecedented collection of inspiring action shots, wild landscape images and detailed crag photos. It has been researched and produced by the Ground Up team, which consists of Simon Panton (principal author and chief editor/whip cracker), Rob Wilson, Al Williams, Al Leary, Graham Desroy and Simon Marsh. Invaluable feedback and advice has also been drawn from a large pool of active climbers; the following 'local experts' have been especially helpful: Mark Reeves, Pete Robins, Rich Betts, Jon Ratcliffe, Jez Stephenson, James McHaffie, Noel Craine, Neil Dyer, Paul Barker and Adam Wainwright. And then there are the photographers: Ray Wood, Jethro Kiernan, Alex Messenger, Al Leary, Graham Desroy, Simon Panton, Rob Wilson, Adam Long and John Coefield. Great guidebooks should inspire as well as inform, and without the magical images that this group of inspired snappers put forward, this would be a much weaker book. The guide is due out in August 2006; it will be distributed by Cordee. Buy yours mail order from V12 Outdoor and all good outdoor shops.